Choose from over 10,000 products! With the KONG Squeezz Jels, fetching will become a challenging activity for your dog. Available in two sizes. The coloured animals squeak and bounce in an unpredictable pattern when they are thrown. The KONG Squeezz Jels are easy to use and suitable for indoor as well as outdoor use. 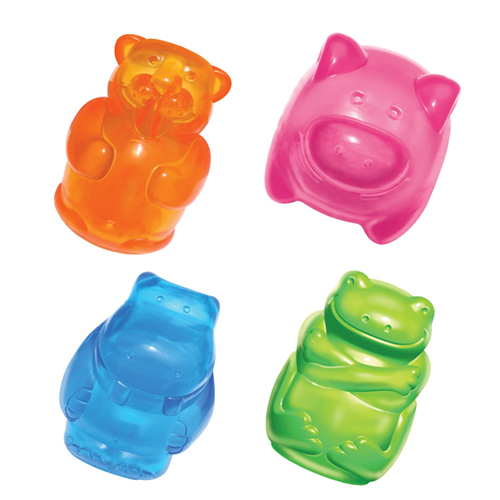 The KONG Squeezz Jels are available in Medium and Large size and are delivered individually. This product is delivered at random, you cannot select your colour. Have you used KONG Squeezz Jels before? Let us know what you think about this product. Yes, sign up for our Vetsend newsletter and receive the latest news, great deals and exclusive discount coupons and tips & advice from our in-house vet. Sign up and save 5% on your first order!